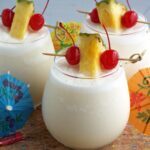 Three Ingredient Frozen Pina Colada is a classic tropical cocktail made with pineapple juice, coconut milk and coconut rum…perfect for a hot summer day. Add ice, nectar coconut milk and run to the blender. Serve with pineapple and cherry garnish.